The surfaces between teeth are not easily accessible by toothbrush; therefore, the best way to clean them is by flossing. The ideal frequency for flossing is like brushing: ideally after each meal, though one time a day (before going to bed) is the minimum necessary.To start, cut a piece of dental floss (approximately 2 feet). Wrap both sides of the floss around your middle fingers. Using your index and thumb, glide the floss in between all of your teeth one by one. When flossing, make sure you are not cutting your gums. The goal is to clean the teeth surfaces, not the gums. 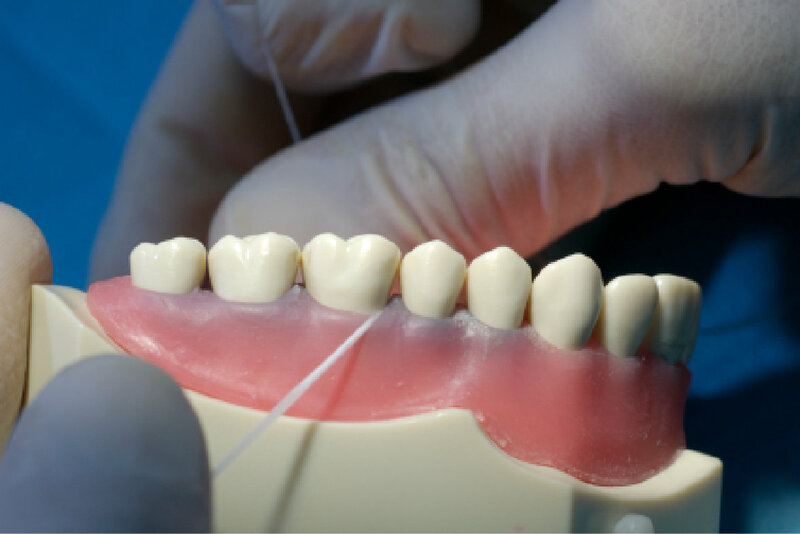 In the space in between the teeth, press the floss against each side of the tooth (hug the tooth) and gently move it back and forth and up and down. Then move to the opposite surface of the adjacent tooth. If you have any questions about flossing your teeth and you live in Northern Virginia or the surrounding area, give us a call today!